Recently we were contacted to assist in the research of one of Australia’s biggest pests – Collingwood Supporters. OK; Cane Toads! Cane toads are regarded as a prototypical case of a feral species (others being rabbits, foxes, cats) and are considered a major threat to our Australian ecology as the species has dispersed very effectively throughout Northern Australia over a short period of time. The long-term effects of cane toads on the Australian environment can be difficult to determine, however some effects include the depletion of native species that die eating cane toads; the poisoning of pets and humans; depletion of native fauna preyed on by cane toads; and reduced prey populations for native insectivores, such as skinks. 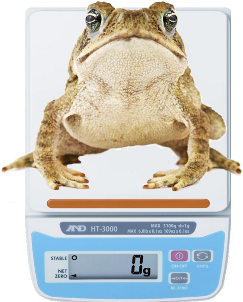 Emily Gregg a researcher from Melbourne University contacted A&D Weighing as her research team needed to investigate water loss and water uptake in toads to better understand how the toads can survive in such varying environments and habitats. It is hoped that this research into the study of the cane toad’s survival will assist in vital further management of this invasive species. 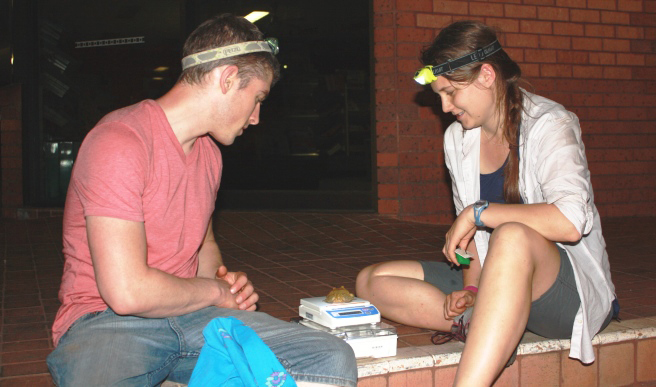 Emily and her team are conducting field work with live moving toads so she requires a scale that can quickly measure weight, is light and portable, and that she can easily tare for accurate results. Our A&D HT Series scale is ideal for the job. Below is a photo of Emily and her supervisor Reid Tingley carrying out a typical check. This is another example of A&D Weighing continuing to prove that economical, Australian supported solutions are a key resource for local industry.